COLUMBIA, Mo 5/10/16 (Update) -- By the so-called Law of Supply and Demand, more apartments should mean lower rents. So why have rents in Columbia skyrocketed, as thousands of student apartments and other rentals hit the market -- so many that Brookside developers said the market was oversupplied almost two years ago? The rental unit pricing model has changed, from a per-unit rate to a per-bed rate. Where once Jane Q. Landlord rented a three-bedroom house for $750/month, now she can rent three bedrooms for $350 each -- a bargain by student housing standards -- raising the rent for her house to $1,050/month. The effect is a $300/month rent increase for Jane because market makers -- large apartment builders with an outsized influence on the rental market -- have changed the local rental-pricing model. Economists might call this counter-intuitive result a market-maker shift of the supply curve. As it is adopted by all landlords -- not just student apartments -- the new per-bedroom pricing model shifts the supply curve to the left, causing the price of an apartment -- the rent -- to rise. You can see this effect in the chart to the right (click for larger image). 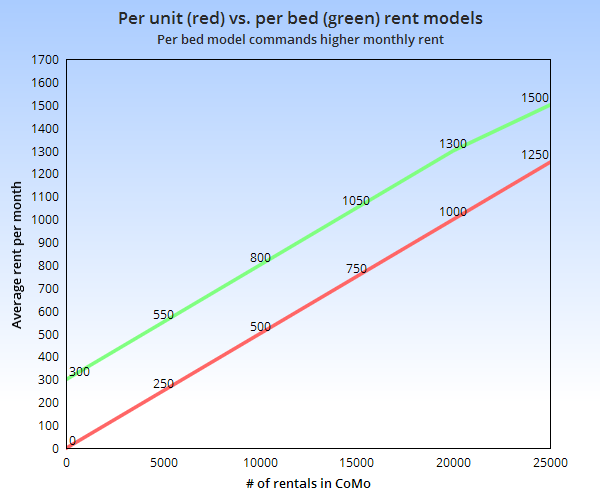 The red line represents the supply of rentals under the old per-unit pricing model. The green line, shifted leftward, represents the new per bed pricing model. Now, what used to rent for $750 rents for $1,050 and so forth, even as the number of rentals increases. Developers use the per-bed pricing model to recapture a significant cost: extra bathrooms. Traditional apartments might have 4-bedroom/2 bath units. But student apartments provide each bedroom with its own bathroom, resulting in higher costs and higher rents. The Brookside on College designs at this link illustrate a layout typical of student apartments. The 4-bedroom/2 bath apartment is now a 4-bedroom/4 bath apartment with other rooms shared: kitchen, living room, laundry, and common area. College dorms built in years past often had one large bathroom shared across many 2-person dorm rooms. This design lowered costs, once the chief goal in student housing. Today, with student loans effectively subsidizing student housing, the opposite is true. With this pod design, student apartments are "purpose built," and do not lend themselves to small families, single adults, or populations other than students. As Columbia Realtor Brent Gardner pointed out on his KFRU radio show, purpose-built housing is difficult to re-purpose. If the student debt bubble bursts, it will be in serious jeopardy. Other factors have contributed to higher rents, too. Boone County property taxes have soared in recent years, as have fees and rates connected to renting (utilities, inspection fees, etc.). -- Mike Martin. A property manager for 26 years, Martin has seen first-hand the effect of student apartments on rents. An earlier version of this story ran in 2014.